This past week kicked off with a boost of energy and hard work as the cast began to rehearse the scenes where Scrooge sees himself as a young man enjoying a party hosted by his former employer Fezziwig. 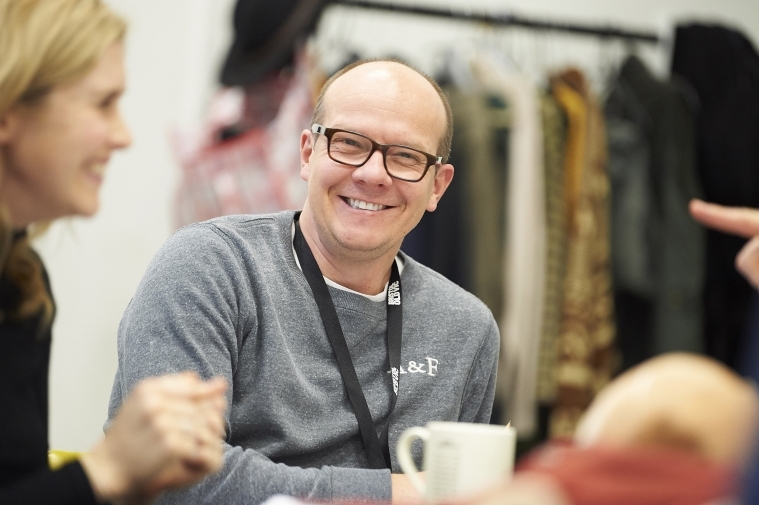 Movement director Michelle Gaskell visited the rehearsal room to create a choreography for the party scenes together with director Lee Lyford and the cast. The result is a fantastically fun mix of period dance and contemporary moves that combined with Gwyneth Herbert’s upbeat and playful music will bring a smile to the face of even the Scroogiest of audience members. This busy and movement-filled start to the week seems to have defined the days that were to follow and as we get nearer to the opening of the show, the room seems busier and the pace at which the company works seems to have reached a new level. Scenes, songs and choreographies are being rehearsed with great intensity and new ideas are being churned out by the minute. “My brain is fried” was quite possibly the most used phrase of the week. Yet, despite nerves, stress and fried brains making themselves present, morale is high and playfulness, generosity and kindness still define the rehearsal room of A Christmas Carol. Much of this is thanks to director Lee Lyford and musical director Gwyneth Herbert who, regardless of their work load, inject each rehearsal day with new energy and enthusiasm. Energy and enthusiasm, as well as the occasional fried brain, are sure to be at the core of this new week ahead which will see the company working on the final scenes of the play as well as the first days of technical rehearsal.